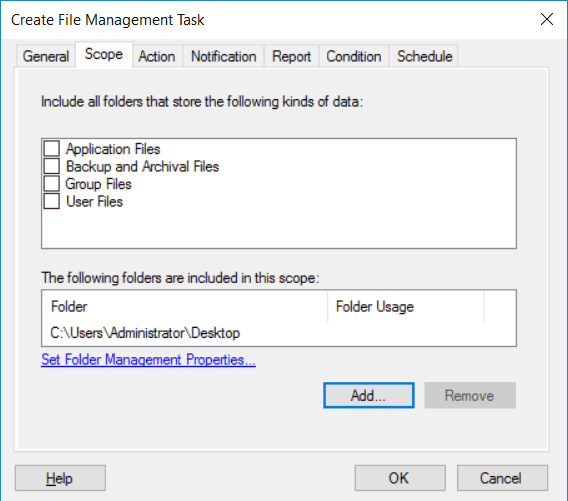 From Server Manager, select Tools > File Server Resource Manager and then select File Management Tasks as shown below. We can now select “Create File Management Task” from the actions menu on the right. 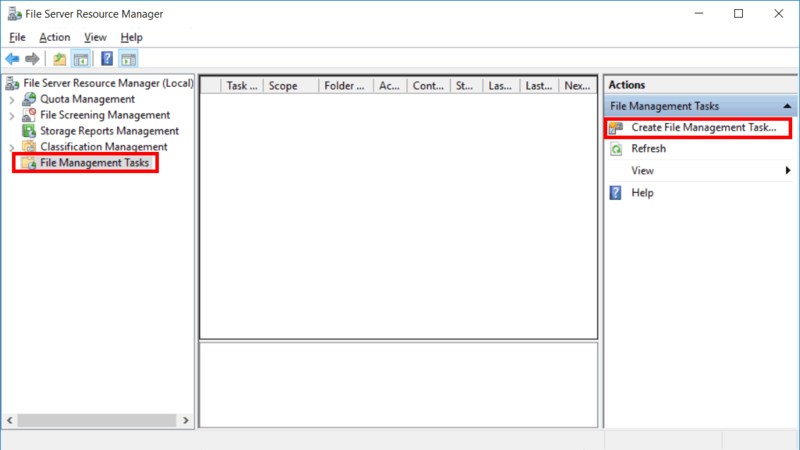 This will open the “Create File Management Task” window as shown below. It starts on the general tab, where we can give the task a name, description, and optionally tick to enable or disable the task. In the scope tab we can select the type of files to include from a predefined list of types, or otherwise add a custom folder. In this example we’ve added a custom scope to include everything on the Administrator user’s desktop. On the action tab we can select the action that we want to take place from either file expiration, RMS encryption, or a custom action. When selecting custom we are able to select a script or executable file to run as a specified user. 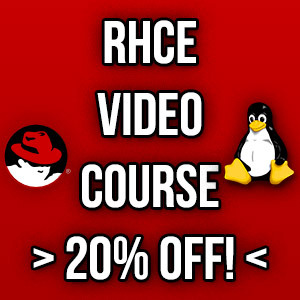 File expiration allows us to select a directory that we want to expire files within which will move them to an archived location after a specified period of time, while RMS encryption allows us to encrypt files that are in scope and match the set conditions. On the notification tab we can select to add a contact. 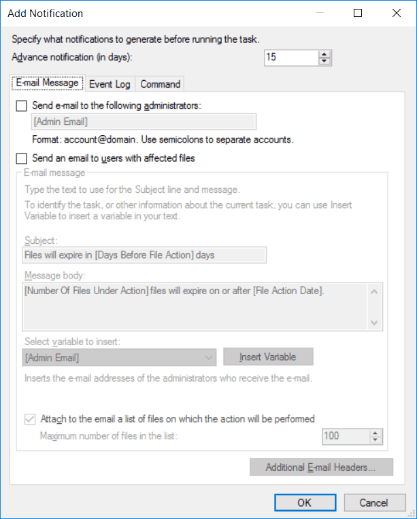 We can then select an email address to send to, an event log message to log, or a command to run as part of the notification activities. On the report tab we can select what we want to log, and the format that the report should be generated in. 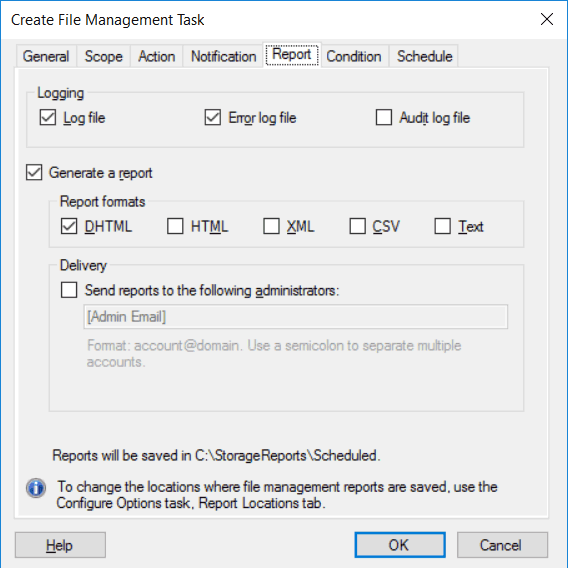 Reports will be automatically saved in the C:\StorageReports\Scheduled folder, and we can also optionally select to email a report to a specified email address. On the condition tab we have some options with how we want to deal with file expiration, in this case I want to expire files 5 days after that have been created. 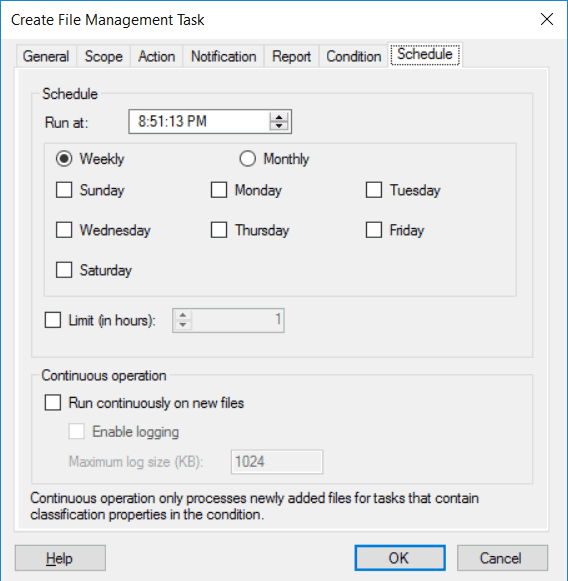 Finally, on the schedule tab we can run the file management task at a specific time, on specific days of the week, or days in the month. The task can also be set to run continually on future files that match what we set in the scope tab. Once the file management task has been created, we can view it in the in the file management tasks section as shown below, which allows us to view a summary of what we’ve configured. 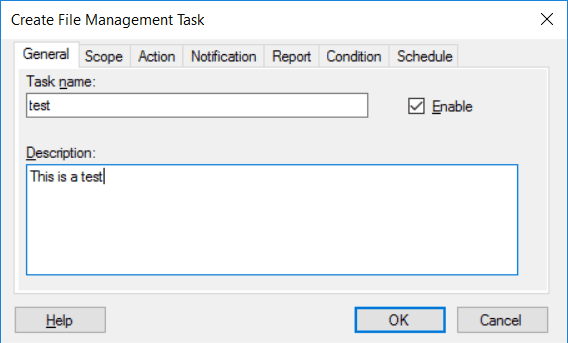 We can then optionally right click a task and select to run it now if we don’t want to wait for the scheduled time to happen. 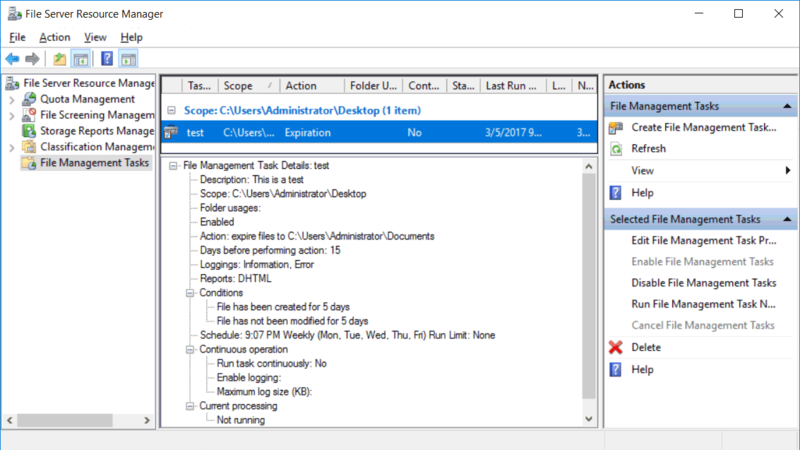 By combining all of these options we can configure file management tasks capable of performing powerful scheduled actions. 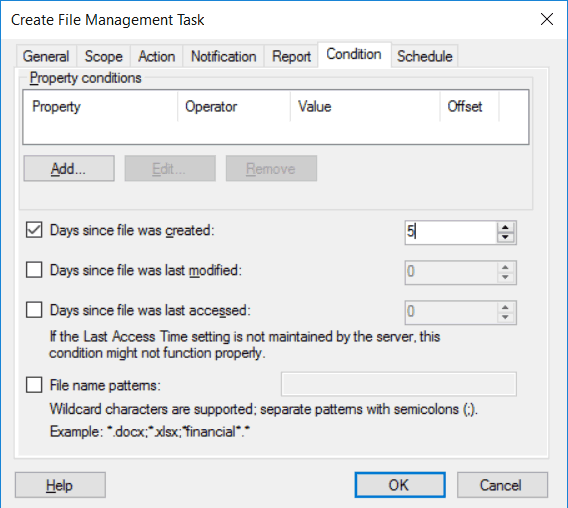 We can configure file management tasks with File Server Resource Manager (FSRM) in Windows Server 2016 to perform file expiration, RMS encryption, or custom tasks. 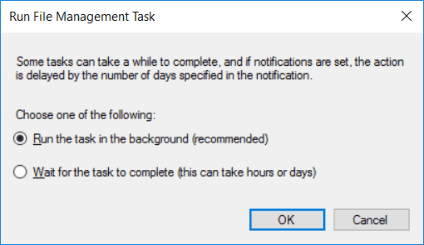 These tasks can be run on a scheduled time, or any time manually, and can be configured to generate and email a report or other notification.